The photo on the left, by Cian Ginty on Flickr, shows the HMV store on Grafton Street, Dublin, closed up on a Saturday night. I read the news today, oh boy, about how 300 Irish jobs are at risk as HMV enters Administration in the UK. None of the Irish media coverage that I have seen or heard contains anything on the formal fate of the Irish operation. It could be put into Examinership (which is the equivalent of the UK’s Administration regime); or, since it is a relatively small part of the total operation, and it is tightly bound to the UK business, the Irish operation might be left to trade normally while the UK administrators get on with things. In both the UK Administration regime and the Irish Examinership regime, the business seeks the protection of the court in a bid to put in place a scheme to allow the business to continue trading. If the bid is not successful, then HMV will cease trading, and the shutters will come down more permanently not only on the Grafton Street store but on all 236 of its stores after 92 years of trading. HMV’s administration means it can legally declare gift vouchers worthless, a blow for those who received one as a Christmas gift. At least as a matter of Irish law, I don’t think that the matter is quite so clear cut. The National Consumer Agency has a very useful page on the general consumer law issues surrounding vouchers, tokens, and gift cards, and provides good advice to consumers thinking of purchasing them, as does Tina Leonard on her site (for the UK, have a look at this BBC article). But the uncertainty now is not so much about the validity of vouchers, tokens, and gift cards in general, but rather as to whether, if they are valid, HMV can nevertheless repudiate them because it is in Administration in the UK or in Examinership in Ireland. Where proposals for a compromise or scheme of arrangement are to be formulated in relation to a company, the company may, subject to the approval of the court, affirm or repudiate any contract under which some element of performance other than payment remains to be rendered both by the company and the other contracting party or parties. This is a limited power to get out of contracts, and it can be done only with the approval of the court. A unilateral decision by an Examiner simply isn’t sufficient. Since no Irish court has approved the repudiation of vouchers, tokens, gift cards, and so on, then section 20(1) does not provide a power to get out of the contractual obligation to honour them, and a blanket refusal to do so cannot be justified by the mere fact of an Examinership. 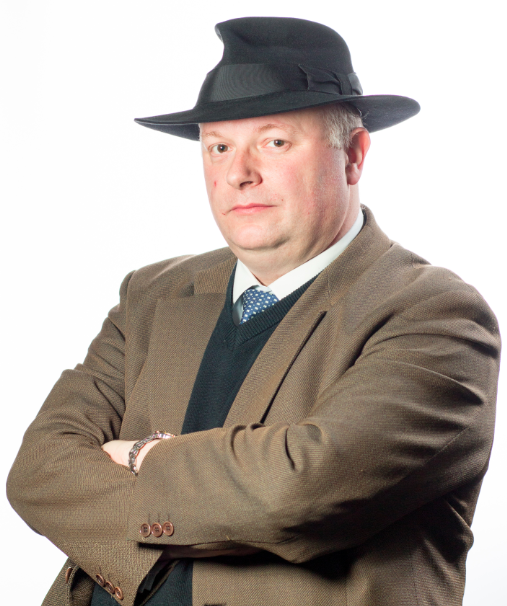 (Update: Moreover, in the UK, it would seem that an administrator does not have any similar power at all (see Re P&C and R&T (Stockport) Ltd  BCLC 366); and, if this is the case, then a blanket refusal to honour vouchers, tokens, gift cards, and so on cannot be justified by the mere fact of an Administration. Of course, if (when?) HMV goes into liquidation, then all bets are off: in both Ireland and the UK, liquidators can disclaim contracts, and even if they don’t disclaim the vouchers, they would rank as unsecured creditors in the insolvency). 9. HMV reserves the right to add to or waive these terms and conditions on reasonable notice for legal, security or regulatory reasons or to discontinue the gift card scheme at any time in the event of circumstances beyond its reasonable control. Customers will be notified in advance via in-store displays and the HMV website in the event of any such change. 12. HMV reserves the right to (i) stop issuing Cards at any time; (ii) on notice to alter or amend the terms and conditions of operation of the Card and/or the Rewards Club; and/or (iii) on notice, withdraw or cancel the Cards and/or the points (including the redemption and issue of such) and/or (iv) terminate the Rewards Club. A Cardholder may terminate his/her Card and/or Rewards Account at any time. 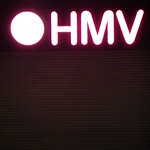 It seems to me that a term that allows HMV to repudiate vouchers, tokens, and gift cards would likely fall foul of either or both of these provisions; if so, it is an unfair term which is not binding on consumers, who can still therefore insist that HMV honour them (in the UK, the 1999 Regulations, and an earlier 1977 statute, are to the same effect). After all, each voucher, token, and gift card represents a contract, and, from the contract, there’s no turning back. (Update: Another blawger, Andrew Sharpe, reaches the same conclusions in his post MHV – Heist My Vouchers (I wish I’d thought of that title)). In practice, though, if HMV’s employees have been instructed not to honour vouchers, tokens, and gift cards and so on, then an individual consumer is unlikely to convince an employee to do otherwise. It will therefore require action on the part of the organisations like National Consumer Agency, the European Consumer Centre Ireland, and the Consumers’ Association of Ireland. (In the UK, the equivalents are the Office of Fair Trading, the UK European Consumer Centre, and Which? – see the Which? HMV page). Updates: The Irish Examiner is reporting that “HMV has confirmed it will not be redeeming gift vouchers in its Irish stores ‘for the time being’.” Meanwhile, Dermott Jewell of the Consumer Association of Ireland has reminded consumers that, under section 14 of the Sale of Goods and Supply of Services Act, 1980 (also here) provides a remedy against a credit card company if the voucher, token, or gift card was purchased by credit card (a similar statutory remedy is available in the UK). Moreover, in a statement on the as the Consumer Association of Ireland (CAI) website, he says that “the advice from the Adminstrators of HMV that they will not accept or honor their contracts with consumers holding such valid vouchers, tokens or cards is a matter for referral … to the Director of Corporate Enforcement” (the ODCE). I agree. However, in that statment, he says that it is matter for referral “only” to the ODCE, and with that I disagree. Given that a refusal to honour vouchers is a breach of a contract with consumers, in my view it is also a matter for the National Consumer Agency (NCA), and I look forward to the ODCE and the NCA both getting involved and putting HMV to rights as soon as possible. Finally, he has called for legislation to protect consumers with gift vouchers belonging to companies who get into financial difficulties. Legislation to clarify for consumers and retailers what their mutual rights and obligations on foot of vouchers actually are would be an excellent idea in principle; but it is not necessary to clarify that HMV cannot simply disclaim liability on vouchers and gift cards merely because they want to do so. Public statements to this effect are so much spin and wishful thinking; and wishing and hoping and thinking and praying do not absolve HMV of their contractual obligations pursuant to the vouchers, tokens, gift cards, and so on. 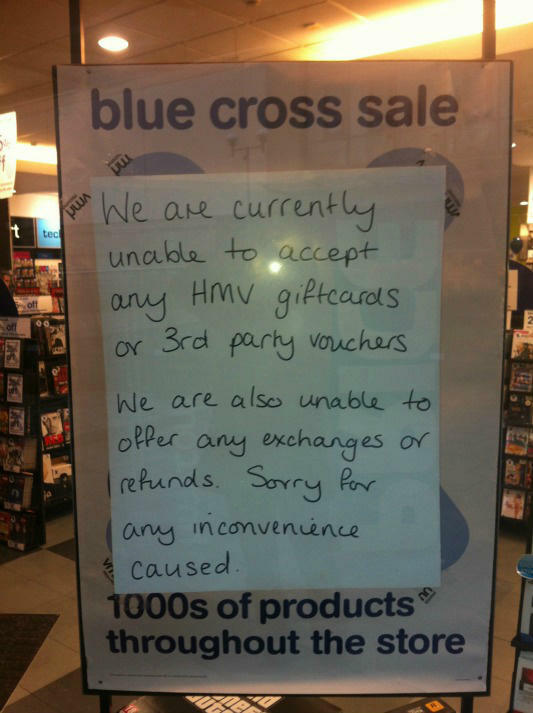 Further updates: @BBCNews posted the photo on the right of a sign in the window of HMV in Hemel Hempstead this morning, that they “are currently uable to accept any HMV giftcards or 3rd party vouchers” and “are also uable to offer any exchanges or refunds”. Not only is the first half of this sign wrong, for the reasons already set out, but the second half is even more so, at least insofar as statutory rights to exchanges or refunds are concerned. Under the relevant legislation in the UK (as well as in Ireland), statutory rights to exchanges or refunds cannot be excluded in this way (indeed, the display of such a notice to the contrary could constitute a criminal office in Ireland (see section 11(2)(a) of the Sale of Goods and Supply of Services Act, 1980 (also here)). Meanwhile, TheJournal.ie reports that the NCA has said that the decision not to honour vouchers, tokens, gift cards, and so on, “is ‘very disappointing’ given that consumers bought vouchers over the Christmas period on the expectation they could be redeemed”. This statement does not seem to be on their website, and it is simply not good enough. The vouchers are valid, and HMV’s refusal to honour them is a matter which the NCA – as the statutory body established by the Government to enforce consumer law and promote consumer rights – should be taking very seriously indeed. The same is true for the OFT, which is the UK’s statutory consumer and competition authority. Right now, they seem to be busy doing something close to nothing on this issue; they ought to be far more proactive about this – they should be shouting from the rooftops that the vouchers are enforceable; this might force the media to stop running HMV Administrators’s spin; and it might even force HMV into a change of heart, and honour the vouchers during the course of the Administration. “When you hear that a company is closing down, or you hear rumours that it is about to close down, you will often also hear the words liquidation, examinership, administration, and receivership. This news can be of concern to everyone involved including traders, suppliers, creditors, staff and consumers. “Our information will help you understand the impact on you if a company going out of business. Each situation is likely to have different circumstances so our information is a guide only and you should bear this in mind. You should, however, act quickly in all cases. “In general, you may be at greater risk of suffering a loss if you have paid for goods or services that haven’t yet been delivered when a trader or company goes out of business. “If the company goes into examinership, liquidation or receivership, you will be treated as an “unsecured creditor”. A creditor is someone the company owes money to. You, as a consumer, are deemed a creditor if a company goes out of business and has not delivered goods you have paid for and therefore owes you money. However, as an unsecured creditor you rank behind other types of creditors, such as Revenue, staff of the company who are owed wages and banks that are owed money by the company. When goods are delivered, check them immediately for possible faults and to make sure they are the items you paid for. If possible, pay by credit card as all credit cards provide ‘chargeback’ rights, so you can get your money back if the items are not delivered. Some debit cards also provide chargeback, but not all do. Get more information in our Disputed transactions ‘Chargeback’ section. Use gift vouchers or credit notes quickly. If a business goes into liquidation and you have an unused gift voucher or credit note, you will be treated as an “unsecured creditor” under the liquidation process. “If you have paid money over to a trader who goes out of business before your goods are delivered, what can you do? “If the retailer goes into liquidation and your goods have not been delivered, contact the liquidator for information on how to take possession of your goods. Your contract is with the retailer. So, if a retailer’s supplier goes out of business, rather than the retailer itself, the retailer should fix the problem for you. Check the company’s website and also the website of the liquidator, examiner or receiver to get the latest news on the company’s situation. Contact the official appointed to look after the company’s affairs for further details. If you paid for goods by credit card or ceratin debit cards, ask your card provider to reverse the transaction using a chargeback.